The method (not without its critics) is trap-neuter-return. KHS vets say it’s documented to work in gradually reducing feral, pardon me, community cat colonies. Adult feral cats can’t be socialized for placement as pets. 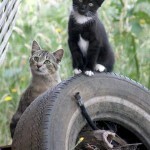 The past approach to eradication of feral cat colonies has been to trap and euthanize the animals. But that doesn’t work well, according to KHS veterinarian Jen Stonequist. Because feral cats are territorial, eliminating members of the colony simply creates a void that is soon filled again by new cats – and their unchecked litters of kittens. The cats who live in these colonies are generally in poor health and carry disease. KHS officials estimate there are more than 2,200 feral cats in the 98366 area code, where the effort is focused. The Community Cats Program, funded through a PetSmart grant provides live traps and training on trapping to willing neighborhood volunteers. Adults are neutered or spayed, and given a full check up and a rabies vaccine before they are reintroduced to their preferred neighborhood. A small mark on the ear prevents repeats. Kittens are taken into the humane society for placement as pets. Over time the colony shrinks, as the animals are unable to reproduce. The humane society also has a litter abatement program. If your pet has had a litter, you can bring the babies (dog or cat) to KHS. They will be spayed and neutered, and placed in “forever homes.” KHS also will spay the parent free of charge and return the animal to you. 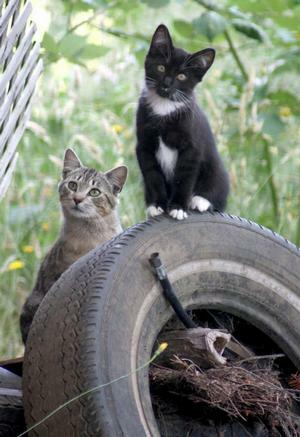 Anyone with information about feral cat colonies in the Port Orchard area, or who is interested in volunteering for the Community Cats program, is asked to contact Kitsap Humane Society at CommunityCats@kitsap-humane.org or call 360-692-6977. It’s that time of year when cats breed at lightening speed, resulting in litters of unwanted kittens … unwanted at least from a human point of view. In today’s Kitsap Sun, you’ll see a Code 911 item about one East Bremerton couple who took matters into their own hands, bought a live trap and rounded up kitties in their neighborhood for deposit at the Kitsap Humane Society. The couple advised neighbors at a meeting that they would photograph each cat, so that pet owners could see if their cats had been swept up with the strays. Not everyone applauded their efforts. One neighbor, who collected his cat from the Humane Society, approached the couple’s home with a baseball bat and now could face charges. Reminds me of a story I wrote in 2008 about Linda Dennis, a Bremerton woman on a mission to reduce the feral cat population. Only instead of shipping cats she caught in a live trap to the humane society, she collected donations to get them fixed and returned them to the neighborhoods from which they came. Dennis has worked in conjunction with Seattle’s Feral Cat Project, which offers low-cost spay and neuter surgeries. The theory of the organization — and folks like Dennis — is that the neutered and spayed cats returned to their home will stake our territory and so prevent new strays from moving in. No doubt stray cats are a problem. We used to have neighbors on either side who fed them. Looking across the fence, I would see hoards of mangy little faces peeking our suspiciously from under the one neighbor’s deck. The smell of cat feces wafted our direction, and I once found a deformed dead kitten in our kids’ playhouse. One of the kittens that wandered into our yard eventually became our family pet. After we decided to keep the little guy, however, it took a lot of care to get him in shape. For one thing, he was so covered in fleas that they were visibly crawling all over his face and into his eyes. And yes, we did get him neutered. If you have stray cats in your neighborhood, how have you dealt with it? Has your approach, like the East Bremerton couple’s, caused conflict? What do you think is the best way to handle the problem of pet overpopulation — other than the obvious, everyone spay and neuter their animals?